Welcome to our page dedicated to the Sky Box Set package – formerly known as the Sky Family package. Here we’ll walk you through what you get with the deal, before doing a bit of comparison to a few possible alternatives; before explaining how easy it is to buy your chosen offers. At Broadband Genie we offer you an unbiased environment to compare the prices and deals from all the leading UK broadband and television services (including Virgin Media, BT and TalkTalk, as well as Sky); and a simple one-click straight through to the provider of your choice. So sit back and let us take the strain out of reading all those tiresome reviews –we’ve done it for you! You can start comparing TV deals including the Sky Box Sets package right now using the comparison table below. 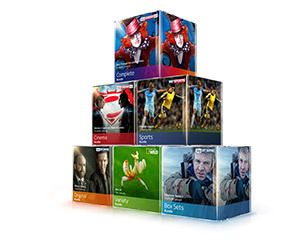 Or read on to find out more about Sky Box Sets and what it has to offer. *Prices increasing from 1st April 2019. 270+ channels inc. Sky Atlantic, Sky 1 and Sky Living. Catch up TV - pause, rewind and record 100+ hours of TV. Sky Go: live TV on laptop, mobile or tablet. Sky Q - Sky's best ever box, record 4 shows while watching a fifth. Sky Cinema with 270+ channels (11 HD) Sky Q box - Sky's best ever box, pause/record/rewind live TV; Sky On Demand; Sky Go. Sky Q experience which allows you to watch shows around the home. Sky Entertainment + 8 Sports channels. Sky Q box - Sky's best ever box, pause/record/rewind live TV; Sky On Demand; Sky Go. Watch shows around the home with Sky Q Mini boxes. *Prices increasing from 1st April 2019. Includes 1 Sky Q Mini box. What is the Sky Box Set package? For a long time these were described as a Sky Family bundle deals, but don’t worry; if that’s what you’re used to from the past you can expect much of the same here – but more. While this isn’t a cheap Sky deal compared to some out there, it is the cheapest one that gives you access to 350 box sets (the clue was in the name, right?) via your free Sky Q box – all on demand, whenever you want to watch them. And we’re talking big titles too. While some of them come and go – depending on if they have a new series coming, for example – you’ll find everything from classics such as The West Wing, The Sopranos and Shameless through to current classics including Game of Thrones, Billions and Entourage. And some of the box sets being available for a limited time isn’t even a problem, because once downloaded you can watch them at your leisure (the Sky Q box has either a 1TB or 2TB hard drive!). What TV channels do I get with Sky Box Sets? As well as the box sets you’ll have access to more than 350 TV channels too – which is a lot more than you get with the cheapest Sky packages. This includes popular channels including Sky Living, Sky Atlantic, Sky Arts and Sky One – all in HD – alongside everything from Sky Sports News HQ to Syfy and Universal. What extras are included with Sky Box Sets? You’ll also get access to the Sky Go app. Available for both Apple and Android devices, as well as on laptops and PCs (even your Xbox), the Sky Go service allows you to log into your Sky account anywhere you can online. Once logged in you can check out all your favourite programmes on the move or on holiday – just as if you were at home! Are there any alternatives to Sky Box Sets deals? If you’re feeling flush you can of course take the sky Box Set deal and add Sky Sports and/or Sky movies to the package, giving you the full monty of TV entertainment. Alternatively, if it looks a little out of your price range, the Sky Variety and Original bundles offer less channels and no box sets – but at a more affordable price. Another way to get a slightly cheaper Sky deal is to pay more, but get much more. Getting a new TV package is a great time to also rethink your broadband deal – and Sky always has some top deals for those looking to switch their broadband to them too. But however you decide to sign up, remember that at Broadband Genie we’re here to help you all the way through the process.